Here is a summary of my piano tuning business manual. 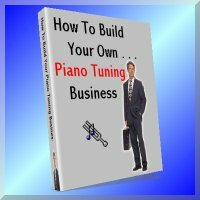 "How To build Your Own Piano Tuning Business". Discover the advertising methods that will get your phone ringing like you wouldn't believe. Whether this is your first customer or your 100th customer you need to know how to build good customer relations so you will get that repeat business that will put your business into overdrive. Keeping accurate customer records is vital to the success of your piano tuning business. Once you set it up it takes very little time to maintain it. Keeping books can be an unpleasant chore or a snap, if you set them up right. Always know the health of your business with a good bookkeeping system. Follow up your customers, or lose 50% of your business! It is not that difficult with the tips I provide you with in this chapter. Piano dealers and piano technicians often have a strained relationship. I offer some effective solutions for a fair & equitable working relationship. Here are guidelines to assist you in doing contract work and still make a reasonable profit. Find out what is essential in doing concert tunings. It is not all that difficult. A profitable piano repair shop is not that hard to set up. You will be surprised how simple it is. Also included in this chapter are plans to build your own piano tilter. One person can easily tilt a piano over on its back for repairs and re-stringing.This tilter is my own personal design included FREE. Some technicians shy away from "selling a job". There is nothing unethical about selling. In this chapter I give you instructions on selling your work without being a high pressure salesman. Sometimes it can be rather difficult to get your pricing just right. Here you can discover how to set your prices for maximum profits. It is essential that you keep learning. When you stop learning, your business gradually dies. In this chapter you will be directed to some excellent sources that will keep you up to date and profitable. Click here for more information on building your own piano tuning business.